America’s national parks system is often regarded as our country’s best invention. And if you’ve visited a number of national parks across the country, there’s no doubt you’ll agree. America is home to 59 national parks and hundreds of other protected national lands, historic sites and monuments. The following are just a few of the many that should be on your travel bucket list for 2019. If you’ve never seen the majesty of Grand Canyon National Park in person, 2019 is the year to visit. 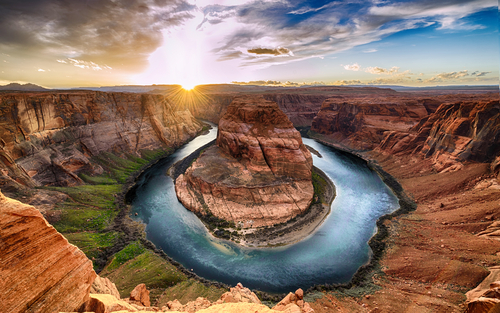 The awe-inspiring, world-famous canyon that drops 5,200-feet deep to the Colorado River is known as one of the Seven Natural Wonders of the World, and most visitors don’t argue with that fact. The park welcomes roughly 5 million visitors each year, so make your camping reservations ahead of time to ensure yourself a spot in the busy spring, summer and fall seasons. America’s western states receive most of the praise for stunning national parks, but those who are in the know are aware that the East Coast offers some of America’s top natural beauty. Maine’s Acadia National Park offers 47,000 acres of mountains, coastline and a well-established trail system. Acadia is the oldest park east of the Mississippi, and the ancient land is home to some of the best hiking on this side of the U.S.
Montana’s Glacier National Park is known as one of the best in the U.S. for its snow-capped mountain peaks, crystal clear lakes, and the glaciers that inspired its name. The best time to visit Glacier National Park is now, because only 25 of the 150 glaciers that existed in 1850 remain. All of the park’s glaciers are expected to be gone by 2030. Travelers visiting the park enjoy utter seclusion, stunning views and enough trails to occupy years of adventure. Don’t forget to stop and see us at Fretz RV before you embark on your 2019 travels. Whether you need to get your RV checked out after storing it for the winter, or are even ready to purchase your next motorhome or travel trailer, Fretz RV is ready to help you make the most of the upcoming year.